Western/Monitor. A gable-roofed structure with lower sheds or lean-tos on both sides, leaving side walls exposed and often windows added to form a monitor. Roy Prestholt Turkey Barn, Lopez Island. In the 1950s Roy Prestholt built this barn for raising turkeys on land owned by T.J. Blake; allegedly it went up in a mere three weekends. However, it is also told that it was never used for its original purpose! Oriented east-west, the structure is 60′ wide by 100′ long, 27′ tall, and has bands of window spaces along its sides. The monitor walls also have ventilation slats, and there are two bands of windows on the gable ends. The plan has two 20′ banks of pens flanking a 20′-wide center drive. It is constructed with a concrete floor and stem walls, with wood framing above. 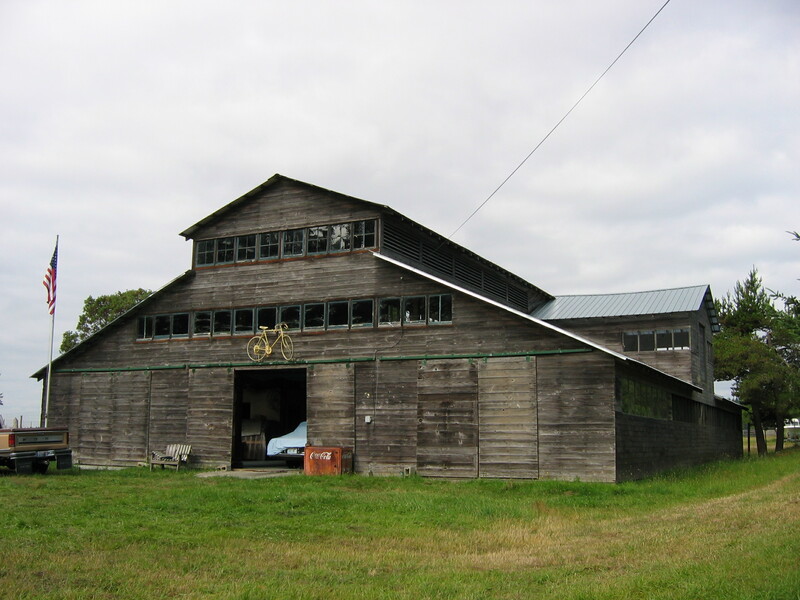 A prominent feature of this barn is the large gable dormer on the north side, which was used as a granary for the poultry food; doors allowed for loading the feed directly into the second-story space above the pens on the ground floor.